Let IBT assist you with your next bucket elevator overhaul. We are a leading distributor of Rubber and PVC leg belting that we slit to width and punch for your bucket application. Fully-line your elevator head housing and other high-wear areas with easy-to-install, urethane liners that offer great abrasion-resistant properties while reducing noise and corrosion. These are available in various thicknesses commonly stocking in expanded metal-backed (EMB) with select thicknesses in fabric backed. 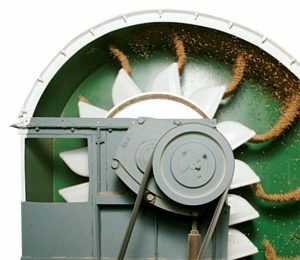 From a head section with urethane liner and UHMW throat plates, down to the boot section with spiral wrapped wing pulleys, IBT will help you select every piece for your grain bucket elevator based on your needs. Give us a call today! IBT PARTNERS WITH NAMES LIKE ESSMUELLER, SCHLAGEL, UNIVERSAL AND CONVEYORS INC to ensure that our customers can rely on the performance of their grain applications in even the most demanding environments. Available in all punching and venting patterns and sizes in top brands, such as Tapco, Maxi-Lift, and 4B for precise discharge, perfect life, high-speed handling, increased safety and ease of installation. Low profile buckets, metallic buckets and custom venting options available on request. We carry every line of elevator bolts, nuts and washers you need to secure the buckets in your bucket elevators, available in carbon and stainless steel. TapCo heavy-duty agricultural buckets handle grains, feeds, fertilizers, seeds, salt, sand, chemicals and a variety of other free-flowing materials. Polyethylene is ideal for most applications, while nylon or urethane is recommended for highly abrasive products or extremely high throughput elevators.Order any of these styles in a “Low Profile” design to increase your grain elevator capacity. Perfect for a high-volume of materials, the high impact and abrasion-resistant Maxi-Lift elevator buckets are most commonly used in grain, fertilizers, pellets, corn, wheat, soybeans and other agricultural and light industrial applications. With thick front lips, corners and walls, the TIGER-TUFF is the original maximum-duty elevator bucket designed and engineered to increase bucket life, reduce breakage and corrosion, and ultimately, reduce downtime and maintenance costs. The TIGER-TUFF Low Profile option is reduced in height to allow for more buckets per foot of belt, increasing bucket elevators’ overall capacity. These top-selling lines of 4B Ultra Heavy Duty Agricultural and Industrial Buckets are available in both in Standard and Low Profile-Style Buckets. With a unique Iceberg® Edge front lip and thick walls and corners for longer service life, these buckets are designed to deliver the maximum possible elevator leg throughput for the lowest cost per ton or bushel. Molded from virgin HDPE (nylon and urethane also available), they are intended for the most severe applications and highly abrasive materials, such as free-flowing agro-industrial materials (grains, feeds, fertilizers and pellets). As specialists in the conveying systems field, IBT Industrial Solutions understands the importance of good systems application in achieving optimum efficiency. With our years of experience in providing conveying systems and components, you can rely on IBT for the best solution to your problems. Contact Jim Boatright, the Conveying Systems Business Group Director at IBT Industrial Solutions for more information on bucket elevators today!